A gorgeous arrangement of flowers is seen here in "Bouquet Exemplar Green". This world celebrates the beauty of flowers in French still lifes where flowers were portrayed in utmost beauty to decorate castles and homes. Here we see the bouquet of flowers, roses and tulips in a copper urn, in a green background. 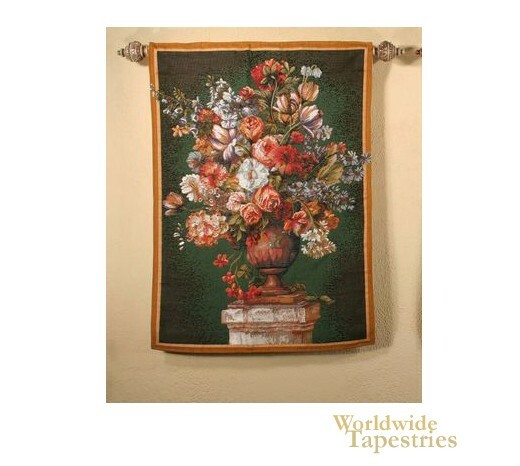 This floral tapestry "Bouquet Exemplar Green" is backed with a lining and has a rod pocket for easy hanging. Note: tapestry rod, where pictured, is not included in the price. Dimensions: W 29" x H 38"